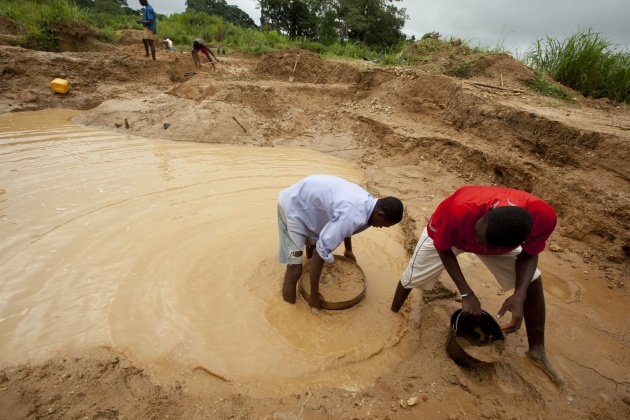 Kono District is famous - or infamous - for supplying 'conflict diamonds' to fund Sierra Leone's bloody civil war from 1991 until 2002. During that time, a faction called the Revolutionary United Front used diamonds to purchase weapons from neighboring countries and launch offenses against the country's already weakened government. Now, Kono's thick clay land has been sapped; few diamonds can be found with simple sifting of sand the way they used to. This doesn't deter thousands of people living on the edge of starvation from mining each day with the hope that one may turn up and turn their future around. Sahr Gando rises every morning with the sun, and lumbers off to scratch and strain through clay, pebbles and mire looking for a shiny stone. He's been mining for 10 years, and struck diamond only once -- a small rock that, after splitting the costs with his small crew, brought in enough money to build a roof for his wife Janna, small baby Mohammad, and his brother Asiah. Gando's lack of luck isn't the only pitfall of mining. By spending hours each day in standing freshwater, he's at risk of contracting a parasitic worm called Schistosomiasis (Schisto, for short). Schisto camps out in freshwater snails, but when it detects body heat, swims into the pores and makes a new home in a person's blood stream. It breeds in the body and if untreated, can cause digestive pain, inflamed liver, bloody stool or urine, and ongoing stomach issues. More than 200 million people like Gando around the world are infected with Schisto, and at least 280,000 die as a result of the disease each year. Kono District is one of Sierra Leone's most Schisto-endemic area. In 2012, the country's Ministry of Health, with the help of international NGOs, carried out mass drug administrations to help hundreds of communities.